Holiday gift-giving in the workplace is a fun way to spread some holiday cheer throughout the office and show your appreciation for co-workers and clients (especially in shared office space)! On the other hand, it can easily turn into a stressful conflict of what to buy, how much to spend, who to buy for, what are the “rules,” etc. Here are some tips on gift-giving in the office to make sure the gesture is appropriate and fun without being a taxing chore. Make sure your company allows and welcomes gifts in the workplace. It is always best to check with the HR department of your business office and/or colleagues to see what the company welcomes and what has been done in the past. Decide who you are giving gifts too. Depending on the size and nature of your company, you might only want to give gifts to your team members or those who work closely with you. Choose a budget and maintain it. Some offices agree to a maximum amount on how much you should spend on each person, but when they don’t, the budget is up to you. Choosing a budget ahead of time will eliminate some stress on what to buy by narrowing gift choices and will also ensure that your gifts are equal and fair for each person. Do not give extravagant or overly personal gifts. In addition, you should steer clear of gifts with humor that can be perceived as offensive or in bad taste. It can offend not only the recipient, but also other co-workers who see or hear about the gift. If you are very close with a co-worker and want to give a personal and/or expensive gift to them, you should do so outside of work. If you're unsure of what to give, gift cards and food are great go-to choices. Gift cards to shops and restaurants around the office or business center are great choices that the recipient is likely to enjoy. For those in our Chevy Chase, DC center in the Chevy Chase Pavilion, gift cards to Starbucks or the Cheesecake Factory are perfect examples. Baked goods and gift baskets are also great choices because they’re fairly low-cost. If food and gift cards are not something you want to give, here are some other great ideas. Remember that giving gifts in the workplace is a choice and some people choose not to give gifts for personal reasons. 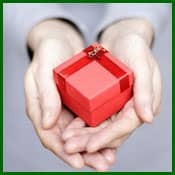 Please don’t pressure co-workers or employees or make them feel that their work environment and job will be compromised if they do not give gifts!